Note: Inspired by memories of my younger days, this story is the second in a series looking back on my experiences growing up in Seattle. It was May 18, 1980. 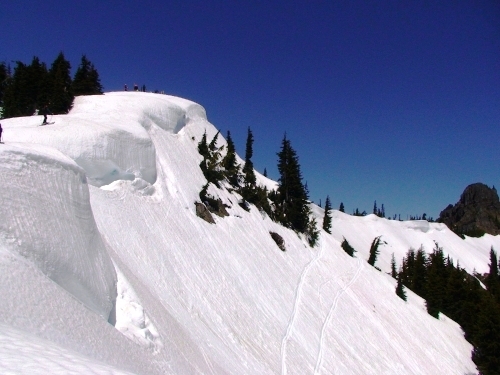 I was standing on a snow-covered ridge south of Chinook Pass on a bright, sunny day with Mt. Rainier towering over the western skyline. Above us to the east stood Naches Peak, a 6,000 foot peak overlooking our snow camp. I was encamped with nine teenagers and one other adult – my friend Scott. Scott and I were leaders of an Explorer Post in Seattle with nine teenagers including three girls. These were kids I had backpacked with a number of times. I had led backpack trips over previous summers with each of them as members of the group. They were all great kids, and like me, they loved the mountains. Now they were sixteen and old enough for their parents to entrust them to my care to teach them mountaineering. Our snow camping and ice axe training was the final field trip before our planned graduation climb of Mt. Rainier. We had hiked in from Cayuse Pass the day before, and we were busy kicking steps in the steep snow after breakfast. Scott and I were supervising ice axe practice from our vantage point on the ridge above our campsite. I looked west to take in the fantastic view, and that is when I saw what appeared to be a massive storm cloud, and it was clearly moving in our direction. I even thought I saw a bolt of lightning. That was strange. Ash cloud of Mt. St. Helens soon after the May 18, 1980 eruption. It was a sunny day and the weather report had been favorable. I looked at my altimeter which would indicate an increase in elevation with any drop in barometric pressure. It showed no change from the day before. This was too weird. Nothing in my experience would account for a sudden weather change without a corresponding change in air pressure. All I knew was what I could see, and that was a colossal storm headed directly for us. In my experience, when something is happening that you do not understand, do something now and ask questions later. I yelled out to the group, ‘That’s it, we are done! Coil your ropes. Pack up. We are leaving NOW!’ These kids could hike! We boogied down the mountain and within an hour we were back at the parking lot. It was about 10:00 a.m. as we headed down the highway. Droplets began striking our windshield, but there was no water. These drops just blew off our windshield. I soon realized those droplets were volcanic ash when, thirty miles down the road, we finally had radio reception. That was when we first heard that Mt. 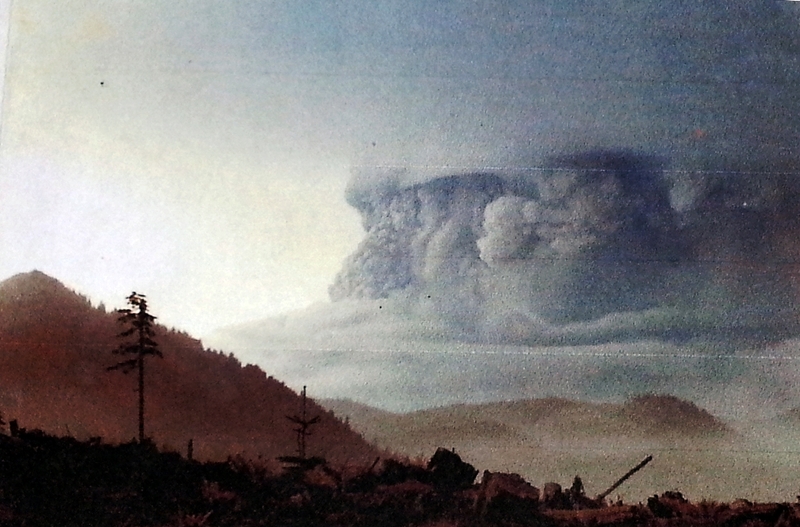 St. Helens had erupted at 7:32 a.m. that morning. I breathed a quiet sigh of relief when I realized we had averted a major disaster. By the time we arrived back in Seattle, the ash cloud from the eruption had turned day into night in the City of Yakima, and our camp had been directly in its path. I have no idea what happened to the day hikers who were out there when the ash started to fall. I only know how relieved the parents of my young climbers were when we called them from my house in Seattle to say we were all safely back in town. A few weeks later, six of my young scouts reached the summit of Mt. Rainier. My reward was the satisfaction of seeing the elation on their faces. It was the 16th anniversary of my first climb of Mt. Rainier, and these kids achieved the same goal – reaching the summit of Mt. Rainier as a teenager. I could not have been happier for them. I eventually lost track of these young people as they got on with their busy lives. Although we did not climb together again as a group, we will always have the experience we shared that day, the day Mt. St. Helens blew her top. This entry was posted in History, Nature, Seattle, Tourism, Travel, United States, Vacation, Washington State and tagged Applecore, camping, Explorer Scouts, Mike Lince, mountaineering, Mt. Rainier, Mt. St. Helens, Travel, vacation, volcanic eruption. Indeed! I did not have time to be frightened at the time. Later, after all the kids were back home, it hit me just how terrible that day could have turned out. What an incredible experience and story Mike. It’s also an excellent example of great decision making in the mountains, those kids were lucky you were there. I was a Girl Scout and a Mariner, so I know about Explorers in Ohio, at least! We liked to go sail boating with the boys in our Explorer group. The fact that you chose to be a leader is awesome, Mike! I think this experience really impacted those young and lively teenagers! I think that your having accomplished reaching the summit when you were a teenager, helped motivate those young people and to see their rapt expressions on their faces: Priceless! Wonderful! Robin, now that we are back in the states, I sometimes reminisce about my younger days like our Explorer Post days. I cannot tell you what prompted me to get us off the mountain on that fateful day. Fortunately, it was our good fortune to have made a quick getaway. My father had shared stories with me from his mountaineering adventures that had a similar theme of being aware of some pending danger. He avoided any number of mishaps, which is why he believed he had a guardian angel. Perhaps I had an angel watching over me that day as well. I would not argue the point even if I could explain it some other way. It’s so strange, Mike, I was a junior in high school when this happened– living in Massachusetts. I remember hearing all about it and being utterly astonished. We all were. Yet, WA seemed like another world. It might as well have been Alaska! Now I live here, and it’s so hard to imagine what that must have been like, when I look around at the serene, beautiful mountains. What an amazingly scary experience for you and your fellow climbers! Such a story to tell. Quick thinking, my friend– Bravo! Living in Seattle during the time leading up to the big eruption of Mt. St. Helens and getting updates on the daily news about steam and ash, most of us locals got complacent about the volcano. Thus, we were caught off guard when it finally blew. Those of us who remember the beautiful, snowy white symmetry of the mountain and the crystal clear waters of Spirit Lake mourn their loss. We also learned about the brutal indifference of Mother Nature when unleashed in all her fury. Such occurrences are rare in the Northwest, but they do occur. People are surprised when I tell them I climbed Mt. St. Helens three times – all before she erupted. What a different perspective from that which many of us across the country had. I only know it as that raggedy mountain, that’s missing its top.